Here at eyeTrade we want everyone to start receiving savings benefits towards your eyewear purchases. Upon signing up with your FREE enrollment, your eyeTrade savings benefits will begin immediately. There are no limitations on how many purchases you do; for you, your family or your friends. Bring in your eyetrade Benefit Card at time of visit and you, your family and friends can receive benefits towards all your eyewear purchases. SAVING ON VISION CARE HAS NEVER BEEN EASIER!! • Click here to print your temporary eyetrade benefit card. 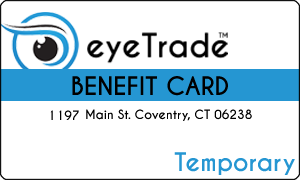 • Bring your eyeTrade benefit card at time of visit. • eyeTrade members receive significant SAVINGS on all eyewear*. • Your eyeTrade benefits begins IMMEDIATELY upon receipt of your FREE enrollment. • eyeTrade provides discounts for card holders, family members and friends. The eyetrade benefits card is not an insurance card. But, it does provide you with flexibility when you need additional eyewear discounts (especially when you need more than one pair of eyewear). Restrictions apply. Ask for details..